Though both gained fame as Saturday Night Live castmembers, Amy Poehler and Will Ferrell spent little time together on the show. Poehler joined SNL for the 2001-02 season, and Ferrell departed at the end of that year, one during which he missed some episodes so he could shoot Old School. Since 2002, Poehler and Ferrell have worked together on a handful of films but they didn’t star together as co-leads until 2017’s The House. When Alex Johansen (Ryan Simpkins) gets admitted to Bucknell University, her parents Scott (Ferrell) and Kate (Poehler) count on a scholarship from their town to cover the bills. Alas, City Council chair Bob Schaeffer (Nick Kroll) decides to use the money for a massive public pool, so Alex’s funds vanish. This leaves Scott and Kate desperate for a way to fund her education. Their semi-degenerate pal Frank Theodorakis (Jason Mantzoukas) inspires a novel way to raise money: via their own underground casino. Kate, Scott and Frank set up a gambling den in his large house, an enterprise that spirals out of control in a variety of ways. Despite the fairly ample star power of Poehler and Ferrell, House sputtered at the box office. Even with a modest $40 million budget, the film lost money, as it took in a mere $25 million in the US – and barely added to that total overseas. Even though I knew audiences shunned it and critics lambasted it, I still held out hope that The House would offer laughs. In addition to its leads, the movie boasts a nice cast of comedic talents, so it seemed like the movie had to offer decent comedy, right? Nope. While the film does kick out the occasional laugh, most of it seems too moronic and pointless to deliver anything more than a chuckle here or there. Some of the problem stems from the general idiocy of the plot points. The House doesn’t worry about any form of logic - that means the story serves the jokes instead of the other way around, and the overall experience suffers as a result. Granted, I don’t expect airtight logic from a farce in which suburban parents raise funds by way of an illegal gambling operation. Clearly The House exists in a world of silly shenanigans, not one in which we should take what we see literally - and yet, the movie still stretches credulity in such a way that makes it tough to swallow. Some of this comes from basic questions, such as: if the Johansens can’t afford to send Alex to Bucknell, why doesn’t she just go to a cheaper school? The movie makes little attempt to attach Alex to Bucknell in a meaningful manner. It posits that she should go there because she kinda sorta likes the place, but we never get the impression that she has to go there for any particular reason. In addition, The House suffers from odd glitches in internal logic. We see that Frank, Kate and Scott maintain a super-secret collection of vaults kept hidden behind a painting – but then they allow gambling patrons to enter this room with the artwork on the floor and the safes exposed! How does this make even the slightest amount of sense? As for the characters themselves, they’re forgettable, and it doesn’t help that Poehler and Ferrell essentially play the same part. This seems like an odd choice, as it makes more sense to give Scott and Kate differing/contrasting personalities. No, this doesn’t mean they need to take on a “mismatched” vibe ala Ferrell’s Other Guys or Poehler’s Sisters, but the movie really fails to differentiate between the two parents. They both seem like variations on the kind of innocent “nice guy” role Ferrell plays in Other Guys and Daddy’s Home, a factor that makes it even more difficult for Poehler to show her own chops, as she usually appears to imitate Ferrell. Speaking of Other Guys, The House even lifts its “character shift” from that movie. As Kate and Scott get more involved in their gambling empire, they turn “dark”, “Intimidating Scott” offers nothing more than a reprise of his “Gator” guise from Other Guys. 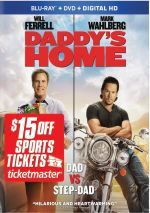 Couldn’t Ferrell have attempted something new? Given how stale and rehashed so much of The House feels, it doesn’t surprise me that the answer is no. As noted, the solid cast manages to evoke some mirth during the film’s brief running time, but too much of the movie seems idiotic and witless for it to become even vaguely satisfying. 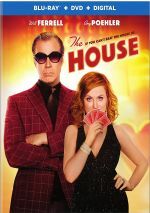 The House appears in an aspect ratio of approximately 2.40:1 on this Blu-ray Disc. This was a terrific visual presentation. I felt that the DTS-HD MA 7.1 soundtrack of House seemed fine but it didn’t excel because of a lack of ambition. Like most comedies, the movie featured a limited soundfield that favored the forward channels. It showed nice stereo spread to the music as well as some general ambience from the sides. A handful of extras round out the set, and we begin with Playing with a Loaded Deck. It lasts 12 minutes, 47 seconds and includes notes from co-writer/director Andrew J. Cohen, co-writer Brendan O’Brien, producers Jessica Elbaum and Nathan Kahane, and actors Will Ferrell, Amy Poehler, Jason Mantzoukas, Rob Huebel, Cedric Yarbrough, Lennon Parham, Allison Tolman, Andy Buckley, Andrea Savage, Rory Scovel, Michaela Watkins, Nick Kroll, and Ryan Simpkins. “Deck” looks at cast and performances. We get a few decent notes, but much of this exists to praise the actors. During the 13-minute, 43-second If You Build The House They Will Come, we hear from Ferrell, Mantzoukas, Savage, Parham, Yarbrough, Scovel, Poehler, Cohen, production designer Clayton Hartley, prosthetic artist Matthew Mungle, and stunt coordinator Todd Bryant. Most of “House” looks at set/production design, and we also learn a little about effects and stunts/action. This becomes a fairly satisfying overview. 11 Deleted Scenes fill a total of 15 minutes, 43 seconds. These tend to add small character bits, with an emphasis on secondary roles. Some amusement results but we don’t find any important story beats that got the boot. We also find 33 Extended/Alternate Scenes. These take up a whopping one hour, 19 minutes, 54 seconds – nearly the length of the film itself! Most of these simply offer more of the same kind of material found in the final film, but some new bits arrive. For instance, Alexandra Daddario plays Corsica, a character not found in the release movie. Like the deleted scenes, these tend to bring us some good material. However, they lack a ton of substance – they’re fun to see but not essential. Still, they’re a nice addition. A Gag Reel lasts nine minutes, 57 seconds. Some of this brings us the usual goofs and giggles, but we also get a lot of variations on jokes, and those make the “Reel” above average. More alternate material shows up via Line-O-Ramas. These run eight minutes, 41 seconds and present additional lines for existing scenes. Once again, these add some amusing gags. The disc opens with an ad for It. No trailer for The House appears here. A second disc presents a DVD copy of The House. It includes the gag reel but none of the other extras. Because I like its leads, I thought The House would provide a fun comedic experience. Unfortunately, they can’t overcome the stupidity and laziness of the script, so the end result lacks real amusement. The Blu-ray offers excellent picture with good audio and a roster of supplements highlighted by ample amounts of unused footage. This becomes a solid release for a disappointing film.